This article is about the 2002 live-action film. For the book from which it was adapted, see The Two Towers. For other uses, see The Two Towers (disambiguation). The Lord of the Rings: The Two Towers is a 2002 epic high fantasy adventure film directed by Peter Jackson and based on the second volume of J. R. R. Tolkien's novel The Lord of the Rings. It is the second installment in The Lord of the Rings film series, preceded by The Fellowship of the Ring (2001) and concluding with The Return of the King (2003). Meeting high critical acclaim, the film was an enormous box-office success, earning over $926 million worldwide and is currently the 39th highest-grossing film of all time (inflation-adjusted, it is the 62nd most successful film in North America). The film won numerous accolades and was nominated for six Academy Awards, including Best Picture, and took home the awards for Best Visual Effects and Best Sound Editing. Frodo Baggins and Samwise Gamgee continue their journey to Mordor to destroy the One Ring by throwing it into Mount Doom. They are attacked in the night by Gollum, former owner of the Ring, but they capture him. Sympathising with Gollum for their shared burden, Frodo asks Gollum to lead them safely to Mordor, despite Sam’s objections. Meanwhile, Aragorn, Legolas, and Gimli pursue the Uruk-hai who kidnapped their friends Merry and Pippin. The Uruk-hai are slaughtered by the Rohirrim army of Rohan, but the two Hobbits escape into Fangorn Forest where they meet the Ent Treebeard. Aragorn’s group later meet the Rohirrim who have been banished by their king Théoden, who is manipulated by Saruman’s servant Grima Wormtongue. Tracking the Hobbits in Fangorn, Aragorn’s group encounter a resurrected Gandalf who perished in Moria, but was revived to help save Middle-earth. Gollum leads Frodo and Sam through the Dead Marshes whilst evading the Nazgûl. They reach the Black Gate to Mordor but Gollum stops them, saying it's too risky and that there is another entrance, finding himself becoming loyal to Frodo for his kindness. The trio later are captured by the Rangers of Ithilien, led by Faramir, brother of the late Boromir. When Faramir discovers Frodo has the Ring, he intends on taking him to Gondor, capturing Gollum when Frodo exposes him. Aragorn, Gandalf, Legolas, and Gimli travel to Rohan’s capital Edoras where Gandalf releases Théoden from Saruman’s power and Wormtongue is banished. Learning Saruman plans on wiping out Rohan with an army of Uruk-hai, Théoden decides to move his citizens to the protection of Helm's Deep, but Gandalf departs to find the Rohirrim led by Théoden's nephew Éomer. Aragorn strikes up a friendship with Théoden’s niece Éowyn who quickly falls in love with him. During a Warg attack, Aragorn falls off a cliff into a river, but is found by his horse and taken to Helm’s Deep. In Fangorn, Merry and Pippin attend an Ent council but learn Treebeard and the others will not participate in the war. They convince them otherwise when they show the destruction Saruman has unleashed on the forests around Isengard. The Ents storm Isengard and imprison Saruman in his tower. The Uruk-hai army arrive at Helm’s Deep, finding a makeshift army of peasants and Elves from Rivendell waiting for them. A great battle follows with Théoden losing hope until Aragorn convinces him to ride out and meet them. Gandalf and the Rohirrim arrive, turning the tide of the battle and destroying the Uruk-hai. Frodo, Sam, and Gollum are taken to the fallen Gondor city Osgiliath but they are attacked by the Nazgûl and Mordor army. Sam informs Faramir of how the Ring nearly drove Boromir mad, stunning Faramir. Frodo is nearly captured by the Nazgûl but Sam tackles him down a flight of stairs, saving him. After the attack ends, Faramir frees the trio and sends them on their way. Gollum, hurt by Frodo’s seeming betrayal, decides to reclaim the Ring by leading Frodo and Sam to a creature he refers to as “her”, leading them away towards Mordor. From left to right: Karl Urban, Bernard Hill, Ian McKellen, Orlando Bloom, and Viggo Mortensen. According to Peter Jackson, The Two Towers is centered around Aragorn. Elijah Wood as Frodo Baggins: a young hobbit sent on a quest to destroy the One Ring, the burden of which is becoming heavier. Ian McKellen as Gandalf the Grey / Gandalf the White: an Istari wizard who fell fighting a Balrog and has now returned, more powerful than ever, to finish his task. Viggo Mortensen as Aragorn: the heir-in-exile to Gondor's throne who has come to Rohan's defence. Liv Tyler as Arwen: an elven princess of Rivendell and Aragorn's true love. Sean Astin as Samwise "Sam" Gamgee: Frodo's loyal hobbit gardener and companion. Cate Blanchett as Galadriel: the Elven-Queen of Lothlórien, who discusses Middle-earth's future with Elrond. John Rhys-Davies as Gimli: a dwarf warrior and one of Aragorn's companions. Also voices Treebeard: the leader of the ents, who is roused to anger after seeing that Saruman had decimated a large part of Fangorn Forest. Bernard Hill as Théoden: the King of Rohan, who is under Saruman's spell until Gandalf heals him so he can lead his people once more. Christopher Lee as Saruman the White: an Istari wizard waging war upon Rohan and devastating Fangorn Forest, who allied himself with Sauron in the previous film. Billy Boyd as Peregrin "Pippin" Took: a hobbit mistakenly captured by the Uruk-hai. Dominic Monaghan as Meriadoc "Merry" Brandybuck: a distant cousin of Frodo's who is mistakenly captured along with Pippin by the Uruk-hai. Orlando Bloom as Legolas: an elven archer and one of Aragorn's companions. Hugo Weaving as Elrond: the Elven-Lord of Rivendell who expresses doubt over his daughter's love for Aragorn. Miranda Otto as Éowyn: Théoden's niece, who is in love with Aragorn. David Wenham as Faramir: a prince of the Stewards of Gondor and captain of the Ithilien Rangers, who captures Frodo, Sam and Gollum. Brad Dourif as Gríma Wormtongue: an agent of Saruman at Edoras, who renders Théoden incapable of decisions, and desires Éowyn. Karl Urban as Éomer: Théoden's nephew and previous Chief Marshal of the Riddermark who was exiled by Gríma. Andy Serkis as Gollum/Sméagol: a wretched hobbit-like creature who owned the Ring for five centuries and now guides Frodo on his quest; voice and motion capture. Craig Parker as Haldir of Lórien: the leader of the Lórien Elves sent by Elrond and Galadriel to defend Helm's Deep. John Leigh as Háma: the loyal doorwarden of the Golden Hall and a majordomo of Théoden. Bruce Hopkins as Gamling: Théoden's chief lieutenant and a skilled member of the Royal Guard of Rohan. John Bach as Madril: Faramir's closest aide, who informs him of battle preparations. John Noble as Denethor II, the Steward of Gondor and Boromir and Faramir's father. Sean Bean as Boromir: Faramir's older brother and a fallen member of the Fellowship who appears in flashbacks since his death. In the Battle of Helm's Deep, Peter Jackson has a cameo appearance as one of the men on top of the gate, throwing a spear at the attacking Uruk-hai. His children and Elijah Wood's sister also cameo as young refugees in the caves behind the Hornburg, and Alan Lee and Dan Hennah also cameo as soldiers preparing for the battle. The son of a producer's friend, Hamish Duncan, appears as a reluctant young Rohirrim warrior. Daniel Falconer has a cameo as an Elvish archer at the battle. The screenwriters did not originally script The Two Towers as its own film: instead, parts of it were the conclusion to The Fellowship of the Ring, the first of two planned films under Miramax. However, as the two films became a trilogy under New Line, Jackson, Walsh and Boyens shuffled their scripts. The Two Towers was the most difficult of the Rings films to make, having neither a clear beginning nor end to focus the script. Nonetheless, they had a clear decision with making the Battle of Helm's Deep the climax, a decision affecting the whole story's moods and style. The most notable difference between the book and the film is the structure. Tolkien's The Two Towers is split into two parts; one follows the war in Rohan, while the other focuses on the journey of Frodo and Sam. The film omits the book's opening, Boromir's death, which was used as a linear climax at the end of The Fellowship of the Ring. Also, the film climaxes with the Battle of Helm's Deep, while the book ends with the Fellowship going to Isengard and Frodo's confrontation with Shelob, scenes which were left for the film adaptation of The Return of the King. This was done partly to fit more closely the timeline indicated by the book. One notable change in plotting is that in the film Théoden is possessed by Saruman, whereas in the book he is simply depressed and deluded by Wormtongue. Afterwards, in the film, Théoden is still unsure of what to do, and flees to Helm's Deep. In the book he rides out to war, only ending up besieged when he considers helping Erkenbrand. Erkenbrand does not exist in the films: his character is combined with Éomer as the Rohirrim general who arrives with Gandalf at the film's end. Éomer himself is present during the entire battle in the book. On the way to Helm's Deep, the refugees from Edoras are attacked by Wargs. The scene is possibly inspired by one in the book cut from The Fellowship of the Ring where it is the Fellowship who battle them. Here, a new subplot is created where Aragorn falls over a cliff, and is assumed to be dead; Jackson added it to create tension. This scene also resonates with a new subplot regarding Arwen, where she decides to leave Middle-earth after losing hope in the long-term possibilities of her love. In the book, Arwen's role is primarily recorded in the Appendices, and she is never depicted as considering such an act. A larger change was originally planned: Arwen and Elrond would visit Galadriel, and Arwen would accompany an army of Elves to Helm's Deep to fight alongside Aragorn. During shooting, the script changed, both from writers coming up with better ideas to portray the romance between Aragorn and Arwen, as well as poor fan reaction. The new scene of Arwen leaving for the West was created, and the conversation scene remains, edited to be a flashback to a conversation between them in Rivendell, on the evening before the Fellowship's departure. A conversation between Elrond and Galadriel in Lothlórien was edited to be a telepathic one. Nonetheless, one major change (already filmed) remained that could not be reversed: the Elven warriors fighting at Helm's Deep, although Jackson and Boyens found this romantic and stirring and a reference to how, in the Appendices of The Return of the King, Galadriel and the Elves of Lothlórien, and Thranduil of Mirkwood were first attacked by an army out of Dol Guldur in Mirkwood, and then later counter-attacked and assaulted the fortress itself. Another change is the fact Treebeard does not immediately decide to go to war. This adds to the tension, and Boyens describes it as making Merry and Pippin "more than luggage". Here, the Hobbits show Treebeard what Saruman has done to the forest, prompting his decision to act. Another structural change is that the Hobbits meet Gandalf the White early on, explaining why the Hobbits do not react to his return when they meet him again following Isengard's destruction. This was explained in the book by Gandalf arriving at Isengard in the middle of the night to talk to Treebeard. The filmmakers' decision to leave Shelob for the third film meant that Faramir had to become an obstacle for Frodo and Sam. In the book, Faramir (like Aragorn) quickly recognizes the Ring as a danger and a temptation, and does not hesitate long before letting Frodo and Sam go. In the film, Faramir first decides that the Ring shall go to Gondor and his father Denethor, as a way to prove his worth. In the film, Faramir takes Frodo, Sam and the Ring to the Battle of Osgiliath — they do not go there in the book. Jackson winks to readers with Sam's line, "By all rights we shouldn't even be here, but we are." After seeing how strongly the Ring affects Frodo during the Nazgûl attack, Faramir changes his mind and lets them go. These changes reshape the book's contrast between Faramir and Boromir, who in The Fellowship of the Ring attempted to take the Ring for himself. On the other hand, (which can be seen only in the film's extended version), it is actually their father who wants the Ring and urges Boromir to get it, while Faramir only wants to prove himself to his father. Boyens contends these plot changes were needed to keep the Ring menacing. Wenham commented on the DVD documentaries that he had not read the book prior to reading the script, so the film's version of Faramir was the Faramir he knew. When he later read the book and noticed the major difference, he approached the writers about it, and they explained to him that if he did say "I wouldn't pick that thing up even if it lay by the wayside", it would basically strip the One Ring of all corruptive power. The meaning of the title itself, 'The Two Towers', was changed. While Tolkien considered several possible sets of towers he eventually created a final cover illustration and wrote a note included at the end of The Fellowship of the Ring which identified them as Minas Morgul and Orthanc. Jackson's film names them as Orthanc and Barad-dûr, symbolic of an evil alliance out to destroy Men that forms the film's plot point. The film depicted Saruman openly presenting himself outright as Sauron's servant, whereas this association was not explicitly stated in the novel (and indeed analysis by Gandalf and Aragorn in the chapter "The White Rider" stated that there was a rivalry instead, as Saruman was afraid of the prospect of being at war with Sauron, if Rohan and Gondor fell). When Alan Lee joined the project in late 1997, Helm's Deep was the first structure he was tasked to design. At 1:35 scale, it was one of the first miniatures built, and part of the 45 minute video that sold the project to New Line. It was primarily drawn from an illustration Lee had once done for the book, though fellow illustrator and designer John Howe suggested a curved wall. Used in the film for longshots, Jackson also used this miniature to plan the battle with 40,000 toy soldiers. As a pivotal part of the story, Helm's Deep was built at Dry Creek Quarry with the Gate, a ramp, and a wall with a removable section and the tower on a second level. Most importantly, there was the 1:4 scale miniature of Helm's Deep that ran 50 feet wide. It was used for forced perspective shots, as well as the major explosion sequence. The film explores the armies of Middle-earth. John Howe was the basic designer of the forces of evil. The Uruk-hai were the first army approved by Jackson, and Howe also designed a special crossbow for the characters, one without the redundancy of opening to reload, the realization of a 15th-century manuscript. Also created were 100 Elven suits of armour, with emphasis on Autumnal colours due to the theme of Elves leaving Middle-earth. 250 suits were made for the Rohirrim. The Rohan designs were based on Germanic and Anglo-Saxon patterns. Most of the weapons were designed by John Howe, and forged by Peter Lyon. Each sword took 3–6 days to make. The Rohirrim's capital of Edoras took six months to build on Mount Sunday, with thatched roofs, but that was simply the exterior: the buildings doubled as offices and lunch halls. The army created a road to the location, whilst the interior was filmed at Stone Street Studios with tapestries designed by Lee, and Théoden's wooden throne partly created by his daughter. Hill endured heavy make-up for the possession scene where his skin was pulled back and released for increased wrinkles. Dourif shaved off his eyebrows and put potato flakes as dandruff in his hair for unnerving effect. The film also provides a look at Mordor and Gondor, in terms of Frodo and Sam's story. Barad-dûr is seen fully in a tracking shot, a design which Howe called a mockery of Gothic Cathedrals. He and Lee fully created the Black Gate (though a typo in the script made the miniature into two)  and Osgiliath, the ruined city reflecting London during the Blitz or Berlin in 1945. The set on a backlot was based around a bridge and reused some of Moria. The hill known as Mount Sunday, in Canterbury, New Zealand, provided the location for Edoras. The Two Towers shared principal photography with The Fellowship of the Ring and The Return of the King between 11 October 1999 to 22 December 2000. Scenes in Rohan were shot early on, and Viggo Mortensen, Orlando Bloom and John Rhys-Davies' scale double Brett Beattie sustained many injuries. Mortensen broke two toes when he kicked an Orc helmet upon finding the remains of the Uruk-hai and believing Merry and Pippin to be dead; this take is the one in the finished film. Bloom fell off his horse and cracked three ribs, whilst Beattie dislocated his knee. Because of these injuries the actors suffered two days in pain during the running sequence leading Jackson to jokingly refer to them as "The Walking Wounded." Afterwards, they went on for three months filming the Battle of Helm's Deep. John Mahaffie handled most of the night shoots. Mortensen got his tooth chipped during the nightshoots, and Bernard Hill also got his ear slashed. Nonetheless, the 700 extras had fun, insulting each other in Māori and improvising scenes, such as the Uruk-hai stamping their spears before the battle begins. They did get annoyed by the Art Department's craftsmanship: the Gates were too reinforced for the Battering Ram scene. Mortensen greatly respected the stunt team, and head butting them became a sign of that respect. Wood and Astin were joined by Serkis on 13 April 2000. For The Two Towers, Weta Digital doubled their staff of 260. In total, they would produce 73 minutes of digital effects with 799 shots. The film would feature their first challenge in creating a battle scene, as well as creating two digital characters who needed to act rather than be a set piece, unlike the previous film's Cave Troll and Balrog. Weta began animating Gollum in late 1998 to convince New Line they could achieve the effect. Andy Serkis "played" Gollum by providing his voice and movements on set, as well as performing within the motion capture suit later on. His scenes were filmed twice, with and without him. Originally, Gollum was set to solely be a CG character, but Jackson was so impressed by Serkis' audition tape that they used him on set as well. Gollum's CG model was also redesigned during 2001 when Serkis was cast as Sméagol, Gollum's former self, so as to give the impression Andy Serkis as Sméagol transforms into the CG Gollum. The original model can still be glimpsed briefly in the first film. Over Christmas 2001, the crew proceeded to reanimate all the previous shots accordingly within two months. Another problem was that the crew realized that the cast performed better in the takes which physically included Serkis. In the end, the CG Gollum was rotoscoped and animated on top of these scenes. Serkis' motion capture was generally used to animate Gollum's body, except for some difficult shots such as him crawling upside down. Gollum's face was animated manually, often using recordings of Serkis as a guide. Gino Acevedo supervised realistic skin tones, which took four hours per frame to render. While the novel alludes to a division within his mind, the film depicts him as having a split personality. The two personas—the childlike Smeágol and the evil Gollum—are established during a scene in which they argue over remaining loyal to Frodo. The two personalities talk to each other, as established by contrasting camera angles and by Serkis altering his voice and physicality for each persona. Treebeard took between 28 and 48 hours per frame to render. For scenes where he interacts with Merry and Pippin, a 14-foot-tall puppet was built on a wheel. Weta took urethane moulds of tree bark and applied them to the sculpt of Treebeard to create his wooden skin. Dominic Monaghan and Billy Boyd sat on bicycle seats concealed into Treebeard's hands to avoid discomfort and were left alone on set sitting in the puppet's hands during breaks. The puppet was shot against bluescreen. The funeral song Éowyn sings during her cousin Théodred's entombment in the extended edition is styled to be a traditional song of the Rohirrim, and has lyrics in their language, Rohirric (represented by Old English). The song does not appear in the book, and the tune is a variation upon a theme of the rímur Icelandic folk tradition; it can be heard as part of track 7 in the 1999 recording of a musical version of the Edda by Sequentia. The soundtrack was recorded at Abbey Road Studios. The soundtrack has a picture of Peter Jackson (barefoot), the composer, and two producers crossing Abbey Road, referencing The Beatles' album of the same name. The Two Towers was released on VHS and DVD in August 2003 in the United States. The date was originally intended to be a simultaneous worldwide release, but due to a Bank holiday weekend in the United Kingdom, some British stores began selling DVDs as much as four days earlier, much to the ire of the film's U.K. distributor, which had threatened to withhold advance supplies of subsequent DVD releases. As with The Fellowship of the Ring, an extended edition of The Two Towers was released on VHS and DVD in November 2003 with 45 minutes of new material, added special effects and music, plus 11 minutes of fan-club credits. The runtime expanded to 223 minutes. The 4-disc DVD set included four commentaries along with hours of supplementary material. In August 2006, a limited edition of The Two Towers was released on DVD. The set included both the film's theatrical and extended editions on a double-sided disc along with all-new bonus material. The theatrical Blu-ray version of The Lord of the Rings was released in the United States in April 2010. The individual Blu-ray disc of The Two Towers was released in September 2010 with the same special features as the complete trilogy release, except there was no digital copy. The extended editions for Blu-ray were released in the U.S. and Canada in June 2011. This version has a runtime of 235 minutes. The Two Towers opened in theaters on 18 December 2002. It made $64.2 million in its opening weekend in the U.S. and Canada. The movie went on to gross $342,551,365 in North America and $583,495,746 internationally for a worldwide total of $926,047,111 against a budget of $94 million. It was the highest-grossing film of 2002 worldwide. Box Office Mojo estimates that the film sold over 57 million tickets in the US in its initial theatrical run. The film holds a 96% "Fresh" rating on the aggregate review site Rotten Tomatoes, based on 248 reviews, with an average score of 8.5/10. The site's main consensus reads, "The Two Towers balances spectacular action with emotional storytelling, leaving audiences both wholly satisfied and eager for the final chapter". The films holds a Metacritic score of 88 out of 100, based on 38 reviews, indicating "Universal Acclaim". The Battle of Helm's Deep has been named as one of the greatest screen battles of all time, while Gollum was named as the third favorite computer-generated film character by Entertainment Weekly in 2007. In CinemaScore polls conducted during the opening weekend, cinema audiences gave the film an average grade of "A" on an A+ to F scale. Winner: Best Visual Effects, Best Sound Editing. Nominee: Best Picture, Best Art Direction, Best Film Editing, and Best Sound Mixing (Christopher Boyes, Michael Semanick, Michael Hedges and Hammond Peek). ↑ "THE LORD OF THE RINGS - THE TWO TOWERS". British Board of Film Classification. Retrieved 24 September 2014. ↑ "The Lord of the Rings The Two Towers". British Film Institute. Retrieved 27 November 2016. ↑ "The Lord of the Rings The Two Towers (2002)". American Film Institute. Retrieved 6 December 2014. ↑ "The Lord of the Rings The Two Towers (2002)". Turner Classic Movies. Retrieved 6 December 2014. 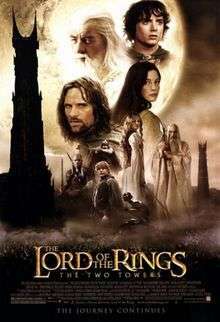 ↑ "The Lord of the Rings The Two Towers (2002)". European Audiovisual Observatory. Retrieved 6 December 2014. 1 2 3 "The Lord of the Rings: The Two Towers (2002)". Box Office Mojo. Retrieved 5 May 2010. ↑ "Top 25 Holiday Movies of All-Time". IGN. ↑ "'Lord' rings true / Tolkien's epic fantasy springs to wondrous life onscreen". The San Francisco Chronicle. 30 December 2001. ↑ "All Time Box Office Adjusted for Ticket Price Inflation". Boxofficemojo.com. Retrieved 24 March 2010. ↑ Head, Steve (13 December 2002). "An interview with Peter Jackson". IGN. Retrieved 24 October 2006. ↑ Lammers, Tim (28 August 2003). "New On Video: 'The Lord Of The Rings: The Two Towers'". nbc4. Retrieved 7 September 2008. ↑ Frodo calls Gollum "not so very different from a hobbit once". In the book, however, Sméagol is described as belonging to "hobbit-kind; akin to the fathers of the fathers of the hobbit Stoors" (The Fellowship of the Ring, "The Shadow of the Past"); Stoors being one of the three kindreds of hobbits. In an appendix, Tolkien calls his relative Déagol Nahald (featured in the third film of the trilogy) a Stoor; therefore Sméagol must have been a Stoor himself. In a letter, Tolkien confirms that Gollum was a hobbit (The Letters of J. R. R. Tolkien, #214). ↑ J.W. Braun, The Lord of the Films (ECW Press, 2009). ↑ "20 Questions with Peter Jackson". Peter Jackson online transcript from Ain't It Cool News. Retrieved 24 October 2006. 1 2 3 4 5 6 From Book to Script: Finding the Story (DVD). New Line. 2003. 1 2 Peter Jackson, Fran Walsh and Philippa Boyens (2003). Director/Writers Commentary (DVD). New Line. ↑ Clint Morris (5 December 2002). "Interview: Liv Tyler". Moviehole. Archived from the original on 11 October 2007. Retrieved 16 February 2007. ↑ Editorial: Refining the Story (DVD). New Line. 2003. 1 2 3 Big-atures (DVD). New Line Cinema. 2003. 1 2 3 4 Designing Middle-earth (DVD). New Line Cinema. 2003. 1 2 3 Weta Workshop (DVD). New Line Cinema. 2003. 1 2 3 4 Cameras in Middle-earth: Filming The Two Towers (DVD). New Line Cinema. 2003. 1 2 Warriors of the Third Age (DVD). New Line Cinema. 2003. ↑ Serkis, Andy (2003). Gollum: How we made Movie Magic. Harpercollins. p. 24. ISBN 0-618-39104-5. 1 2 3 Weta Digital (DVD). New Line Cinema. 2002. ↑ Weta Digital (The Fellowship of the Ring Appendices) (DVD). New Line Cinema. 2003. ↑ The Taming of Sméagol (DVD). New Line Cinema. 2003. ↑ "Two Tower's Score Remains Eligible". Baltimore Sun. Retrieved 15 March 2007. ↑ "UK video stores jump the gun on 'Rings'". IMDb — Studio Briefing. 27 August 2003. Retrieved 29 October 2006. ↑ "The Lord of the Rings: The Two Towers (2002)". imdb.com. Retrieved 2016-03-23. ↑ Josh Grossberg. ""LOTR" Fans Get Credit". eonline.com. Retrieved 2016-03-23. ↑ Calogne, Juan (23 June 2010). "Lord of the Rings Movies Get Separate Blu-ray editions". Blu-ray.com. Retrieved 28 November 2010. ↑ "Lord of the Rings Pre-order Now Available". Amazon.com. 31 May 2011. Retrieved 31 May 2011. ↑ "The Lord of the Rings: The Two Towers". IMDb.com. Retrieved 31 May 2011. ↑ "The Lord of the Rings: The Two Towers (2002)". Box Office Mojo. Retrieved May 31, 2016. ↑ "The Lord of the Rings: The Two Towers". Rotten Tomatoes. Retrieved 2 December 2006. ↑ "The Lord of the Rings: The Two Towers". Metacritic. ↑ "The best – and worst – movie battle scenes". CNN. 30 March 2007. Retrieved 1 April 2007. ↑ "Our 10 Favorite CG Characters". Entertainment Weekly. Retrieved 30 July 2007. ↑ "Cinemascore". Cinemascore.com. Retrieved 22 January 2015.